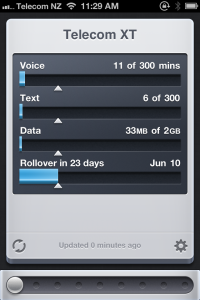 Both companies have similar 2GB data + 5 hours calling plans but Telecom was $20 per month cheaper. I was impressed that there is no penalty for not tying myself to a long term plans, but if you are a plan fan, Telecom will give you an iPhone 4S for $200! In my office, where I receive most of my calls, I would usually have 1-2 bars with Vodafone and a dropped call a day. Now with Telecom I’m getting 3-5 bars depending on the room – that’s twice the signal strength with no dropped calls yet. I ran a bunch of speed tests on my Vodafone and Telecom accounts, similar times of day, similar weather. On average download speeds were 90% faster, uploading was 65% faster and pings were 35% faster with Telecom. Switching was amazingly simple too, they did all the paperwork on the spot and within a few hours I was using my new Telecom sim. I haven’t had a chance to test their call-centre yet but hopefully I don’t have to. Both providers hook up to the brilliant Consume app for checking usage so equal grading here. So as much as I hate to admit it, Telecom have proven to be a much better company to work with than Vodafone. I might even jump on a 24 month plan one day and get that $200 4S, if I do, does anyone want to buy my old 3GS? If you’ve experienced both providers recently I’d love to know how you found the switch. There’s an option for first time registrations which I needed to do. Once I was registered and could log in to that page, I used the same credentials to log into Consume. Nice to have a 2degrees customer perspective! The main reason I didn’t give 2degrees a try was that their 2GB data plans are $200, twice the price I was willing to pay! “SkyTV you’re the new Telecom. We tolerate your complicated pricing plans and mildly put-out customer service lacking a credible alternative.” – @rowansimpson, on Twitter. “Is Sky TV the new Telecom? It is big and it is dominant. And now it faces a regulatory threat which may hinder its efforts to carry its dominance into a new technological era.” – Liam Dann, in NZ Herald. Thanks for that info. I have now set up both my wife and I on consume on my iPhone :). On a side note, I have been on 2degrees with my iPhone about 6 months ago. Was with them for about 6 months +. The main issue I had was very low reception (this is on the north shore Auckland). At home it would go down to edge instead of 3G. Also when I was down the line the data was on edge so super slow! So when I got the 4s I went back to telecom. Awesome speeds, bit pricy but u pay for what u get?